A Christmas tale about a lonely young man who lives on his own and suffers from acute social anxiety sounds like an unusual topic for a festive show for the under 11s, but Otto and the Robin handles the subject with charm. Otto works from home as a travel editor and is so crippled by shyness that he struggles to answer his telephone. His effervescent old schoolfriend, Maggie, tries desperately to include him and help him overcome his awkwardness, pinning her hopes on the Christmas party she’s planning to host. Maggie is assisted in her gentle and patient persistence by the endearingly stubborn puppet Robin. But for all the moral lessons, Tamsin Fessey’s production is also exciting and fun. Day’s physical comedy is outstanding – his techno dancing and laboured morning press-ups are a delight. 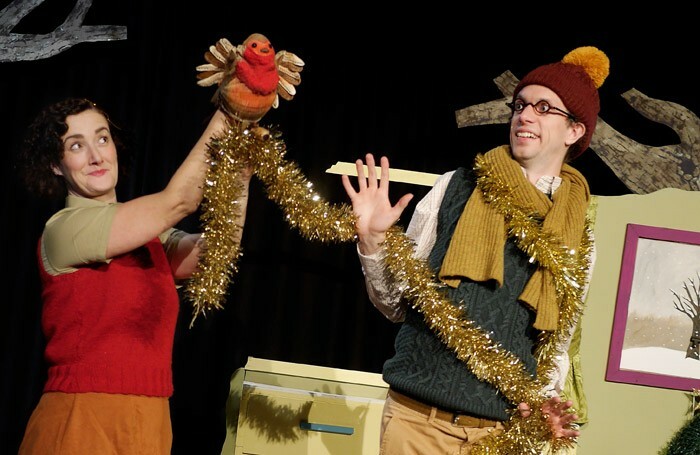 Coupled with the inventive set and Lynne Forbes’ engaging manner as both Maggie and the Robin, Angel Exit Theatre has created an inspiring seasonal treat.